Mike Gann from Charleston, Illinois, presents homeowner David Bailey with a carving of a cross in a piece of the oak tree David used to climb as a child. In less than a week, more than two dozen people in Durant, Mississippi, have placed their faith in Jesus Christ. Homeowner David Bailey was excited to receive a Bible from Samaritan’s Purse volunteers on the day—May 10—that he accepted Jesus as Savior. David Bailey’s first instinct when he heard tornado sirens was to run out of his front door to his neighbor’s house. But David didn’t make it that far.By the time he had opened his door, large tree limbs were being thrown around by the wind. Worried that the tornado would do the same to him, David instead took cover inside a closet in the home he has lived in since childhood. The tornado that tore through the 2,500-member town of Durant, Mississippi, the morning of Sunday, April 30, resulted in one death, dozens of destroyed houses, and nearly 300 homes with some damage. “I was afraid for my life,” David recalled, especially when the large tree in his backyard split apart and fell onto his roof and into his kitchen. David used to climb the oak tree as a boy, nailing a 2 x 4 piece of wood to it as a step to reach its tall, thick branches. “When I heard the tree snapping, it sounded like a bomb,” he said. SIGN UP TO VOLUNTEER A railroad track borders his backyard so David is used to hearing locomotives, but the roaring noise of the tornado sounded to David like one had jumped the tracks and was headed into his house. David still wasn’t sure when he recounted his tornado survival story to Samaritan’s Purse volunteers clearing tree debris from his roof and yard earlier this week. Our disaster relief work—tarping roofs, cleaning up yards, sawing trees all while providing a Christian witness—began in Durant on May 6. Johnny Greer, 24, has known homeowner David Bailey since he was a boy. But Johnny didn’t know when he volunteered that he’d have the opportunity to return the kindness that David showed him. David was uncertain about what being a Christian meant. His mother had taken him to church and encouraged him to know God when he was growing up, but throughout adulthood David had not gone beyond believing in God as Someone he could pray to when he needed help. Throughout the day, the volunteers talked with David about the difference between doing good deeds out of respect for God and having a saving relationship with Him through faith in Jesus Christ as Savior and Lord. “There’s a difference between honoring God with what you say and living for Him as Lord and Savior,” Kathy explained. The next day, David told volunteers that he’d thought all night about these spiritual conversations. Gary Ellington, a member of Williamsville Baptist Church in Kosciusko, Mississippi, which is housing our volunteers, clears debris from a hole in a roof before tarp is attached. Then, when two Rapid Response Team chaplains from the Billy Graham Evangelistic Association showed him the Steps to Peace with God tract—which provides a visual illustration of Jesus Christ being the only bridge to God—David repented and believed. “Now I realize what my mother actually meant and was trying to teach me all those years ago about trusting in God,” David said. One by one, the volunteers hugged David, then encircled him in prayer as they thanked and praised God together. 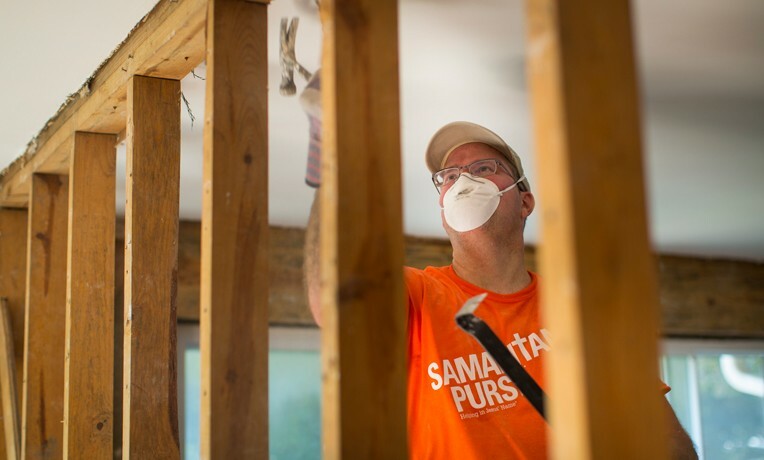 Since our disaster response began in Durant on May 6, Samaritan’s Purse teams and Billy Graham Association chaplains have led 27 people to faith in Jesus Christ. Would you like anything in particular for Mother’s Day? Sally Krasevic’s husband, Mike, asked this week. “Yes, I already have it—this trip,” responded Sally from Harrisburg, Pennsylvania, (pictured at left). Her family had first gifted her airfare for a disaster relief response in honor of Mother’s Day in 2010. Many of the salvations occurred during initial home assessment visits or at the chaplains’ mobile ministry center trailer stationed at Durant Missionary Baptist Church. Latisha Mosley and her 19-year-old niece had stopped by the church to receive Samaritan’s Purse hygiene kits that the chaplains were giving out. Latisha had thought she was a Christian but after going over the Steps to Peace with God tract with one of the chaplains, she realized that she was missing the most vital step—having a relationship with the Lord. So did her niece, who also received Jesus Christ that day.